I'm introducing some of the images from my 3,500-item Pinteret collection. The following is a subset of the Department of Book Cover Design. The original sources for the images can be found in the links in the Pinterests categories. 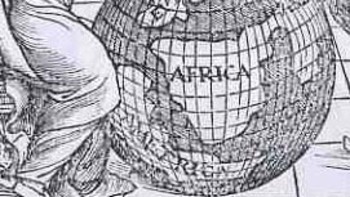 The wood engraving is of particular interest because of the globe upon which Fra Mauro is writing—as you can more clearly see in the detail; shot (below) we can see a large continent labeled “America” just hundreds of miles off the coast of Africa. The Americas still make only guest appearances on globes at this point, and seeing it here, as a bit of an afterthought, is a treat (considering how easy it is to overlook it). There is another Fra Mauro, much more famous than our's above, whose cartographic workshop produced a seminal, magnificent map of the world in 1453, thus bringing the two Mauro's together, if only slightly, via their maps (one great, the other incidental). THE FOUR ELEMENTS. -- The machine of the universe is divided into two, the ethereal and the elementary region. 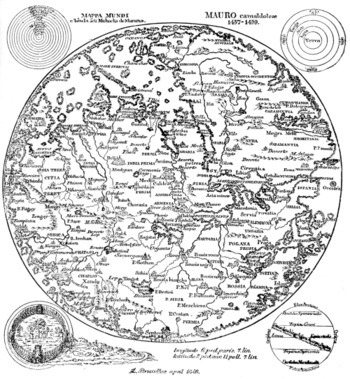 The elementary region, existing subject to continual alteration, is divided into four For there is earth, placed, as it were, as the center in the middle of all, about which is water, about water air, about air fire, which is pure and not turbid there and reaches to the sphere of the moon, as Aristotle says in his book ofMeteorology. For so God, the glorious and sublime, disposed. And these are called the "four elements" which are in turn by themselves altered, corrupted and regenerated. The elements are also simple bodies which cannot be subdivided into parts of diverse forms and from whose commixture are produced various species of generated things. Three of them, in turn, surround the earth on all sides spherically, except in so far as the dry land stays the sea's tide to protect the life of animate beings. All, too, are mobile except earth, which, as the center of the world, by its weight in every direction equally avoiding the great motion of the extremes, as a round body occupies the middle of the sphere. Looking a little more closely at the elements of this image we find a number of interesting bits. Working from the upper right hand corner across and down we find a right angle (for the architectural and building parts of the book), then a sand clock, a decorative laurel wreath with a pocket sundial (!) right next to it, ending with an object that looks as though it might be a physical sciences demonstration tool (I’m guessing). Working down from the “what is it” we see the first cut of a three-times-repeated constellation that I think has nothing to do with the word “Antar” beneath it. Following Venus is, I think a complex compass rose, though it may also be a calendar—I can’t quite tell from the detail of the cut. This is turn is followed by a heavily fortified book (actually this sort of bonding, meant for heavy use, was relatively common at this time)and a score of (5-line staff) music. Returning to the right angle and moving down we se the same constellation under which hangs a very stable-appearing wagon, with a triangle beneath it , followed by a representation of Mercury, the messenger of the gods, who in turn is positioned over a large set of dividers. 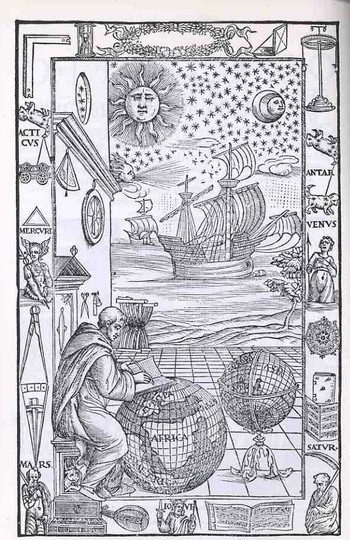 On the wall over the head of Fra Mauro we see two precision instruments—a surveying tool and an astrolabe. The two small tools near Mauro’s head seem to be a scale and a pair of scissors. The central panel shows two caravans (approximately 100-footers? ), being driven by a favorable wind to hospitable shores beneath a starry and benign firmament. The bottom tier is the most emblematic of the set of images, as we see the related Saturn-Jove-Mars all together. Saturn is also Kronos, which is why we see the old horned man caring the scythe of time’s reckoning; he is also the father of Zeus, also known as Jupiter (Juppiter Optimus Maximus Soter (Jupiter Best, Greatest, Savior)), also known as Jove, who stands here crowned and warning us with a sword and dividers. Jove in turn was the father of Mars, who here doesn’t look terribly war-like at all. Punctuating the spaces between these three are a keyboard instrument, a lute and a score of music. I’m not sure that these lyrical/musical devices had anything to do with the three generations of super gods, but there you have it. ECLIPSE DURING THE PASSION MIRACULOUS. -- From the aforesaid it is also evident that, when the sun was eclipsed during the Passion and the same Passion occurred at full moon, that eclipse was not natural -- nay, it was miraculous and contrary to nature, since a solar eclipse ought to occur at new moon or thereabouts. On which account Dionysius the Areopagite is reported to have said during the same Passion, "Either the God of nature suffers, or the mechanism of the universe is dissolved." The cover for this 1939 pamphlet I just found is pretty remarkable--very striking, strong, and capable of some sort of message which could've been helped along by another identifying agent. Thomas Nast it isn't, because it really doesn't send the intended message by just visual means--you have to read the pamphlet to find out its meaning. And as it turns out the octopus represents mail order companies. Located in cities far-ish removed from small communities, the author (F.A. Kremer?, the man who at least copyrighted the thing) maintains in his morality tale that by ordering from far-away places a person causes the failure of local business. He's not far from the truth, especially if you update the language a bit and label the octopus "Amazon" or some such thing--even a megastore like "WalMart" would do. Or any large chain that has spelled the doom of a smaller/local business. In any event I like the graphic, and I sincerely doubt that it has been published before, as there are no copies discernible on WorldCat/OCLC, and my copy (from the Library of Congress Pamphlet Collection) is also a copyright deposit copy. So I suspect that Kremer's effort didn't make it out too far into the world. In a similar intellectual capacity (though not so much in the same genre) as the great John Heartfield, this cover illustration depicted what many were thinking about the Nazi Party in 1931. It appears as the illustration for Brechen die Nazis die Zinknechschaft?? Raffer und Schwatzer!, printed by the SPD (Sozialdemokratisch Partie Deutschland in 1931. It also seems as though it was a response to the recent NSDAP victories in elections for the Reichstag on 14 September 1930. That election was a major show of the Nazis and a semi-modern meet-and-greet campaign for Hitler, a political blitzkreig (in its way), a showing that had been unseen before in German politics, a production of short and repetitive phrasing, long promises and short details. The result was an incredible win for the Nazis, going from fringe element with a comical leading figure to the second-most powerful party in the country, receiving more than 6 million votes and 107 seats in the Reichstag. The SDP had a lot to worry about. In the last election the SDP had 153 seats with the Nazis 12; in September 1930 the SDP lost ten seats while the Nazis took 95, outpacing their new rival by over about 2 million popular votes. In the March 1933 election the NSDAP took control of the Reichstag, ending with 288 seats, with the Social Democrats becoming the new second party with 120. This was the beginning of the end--by the third week in March the Enabling Act was pushed through the NSDAP-Reichstag giving Hitler plenary powers with the ability to make laws without the input of the Reichstag. The Act passed following the strong-handed rule-bending, with only the SDP members voting against it. A new election was called in November 1933, with the Nazi Party being the only part to vote for--it received 92% of the vote, consolidating Hitler's control. A quick note here adding to a growing collection of "deep black" antiquarian images--this one, oddly enough, a simple black sky. As it turns out, there are not that many old images of black skies, night skies...nor are there any great numbers showing dark room interiors, or inside of caves. So when I come across an interesting old engraving/woodcut with a lot of black, it gains my attention. And so with the following, which is the title page from the Spanish astronomer Bernardus de Granollachs, Lunarium: in quo reperiuntur Coniunctiones & Oppositiones Lunae..., which was a small pamphlet of 16 pages printed in Rome in 1516. The booklet contained tables of conjunctions and oppositions of the Moon, as well as this gorgeous title page. The allegorical frontispiece of Gulielmus Saldenus' De libris variorum usu & abuso, (printed in Amsterdam in 1688) is a good outline for what this (little) book is contains--about being good and being bad--and extending that to the treatment of books. The main image is of a bookseller and a customer; through the windows we see the pious headed to chapel, on left; and at right, a good-sized book-burning, which is a fairly rare thing to see on a decorated beginning-of-a-book illustration. The allegory is fairly complete, and seems as though it could not be less not-subtle than it is. In the 16th and 17th centuries it was not terribly uncommon to decorate a title page of a scientific/philosophical work with the portraits of standard-bearers and significant people in the field. This is particularly true in the Baroque era, when so much more of the title page seems to be decorated. I should have kept closer memory of examples of these works, but for right now two will suffice--they are rather good. The first is the work of Pergaeus Apllonius (ca. 260-200 bce) in the Opera, per doctissimum philosopphm Iohannem Memum, printed in Venice in 1537, which contains the first appearance in print of Apollonius' Conics. Around the title of the book we find the half-length portraits of Pliny, Cicero, Quintiliius, Plutarch, Lucan, Aristotle, Demosthenes, Plato, Aristides, Euripedes, Aristophanes, Pindar, Theocritus, Vergil, Horace, Livy, Sallustius/Sallust and Apollonius--a big cast with differing shadows. A great example of a title page dedicated to astronomers is that for Jan Luyts' (1655-1721, an instructor in maths and physics at Utrecht), text Astronomica Institutio, in qua Doctrina Sphaericaa atque Theorica... printed in Utrecht in 1692. It features a "action shot" of five major figures in astronomy: (from left to right) Galileo (who is rarely seen actually holding a telescope and here is brandishing one like a club, holding the instrument very weirdly), a ham-handed Hevelius looking slyly over Galileo's shoulder (though it sort of looks like Kepler in a way, I'm pretty sure that Galileo is Galileo), with Brahe, Copernicus and Ptolemy each holding elegant demonstration devices for their own particular model of the solar system. I'm not sure who the central figure is--perhaps just a generic philosophe. Here's the frontispiece to Galileo's which features Copernicus at right and the seated figure as Aristotle, which bears some fleeting resemblance to the figure above. Galileo's Dialogo (1632) was the open invitation to trouble that Galileo no doubt expected and then famously received, the work being a defense of the Copernican system which at the time of regressive church wisdom posed a direct threat to Catholic belief systems. In the frontis to this work we again see some old friends, finding Aristotle, Copernicus and Ptolemy beautifully (and with realistic old-man slumpiness) portrayed by Stefan della Bella. (The full title of the Dialogo: Dialogue Concerning the Two Chief World Systems (Dialogo sopra i due massimi sistemi del mondo), in which the Copernican and Ptolemaic systems are described and compared. Galileo almost worked within the Vatican’s matrix necessitating a balanced presentation between the different systems, and evidently did so enough for the book to become a best seller, but its ride on the list of the Vatican’s banned (“Prohibited”) books lasted until 1835. Details of the portraits in "continued reading" section below. The initial reaction to this fantastic set of book cover designs by Aleksandr Rodochenko (found at the FlyerGoodness blog, here) was for inclusion in this blog's History of Lines series, given their high dependence on stark geometry and all. 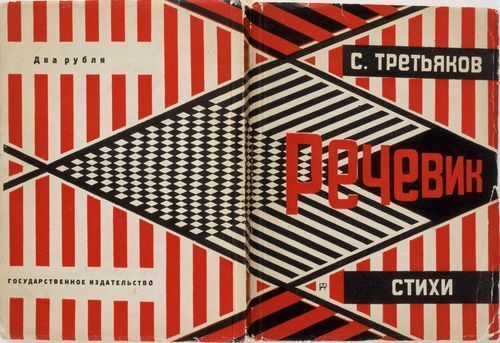 All of the designs are by Aleksander Rodchenko and are from the 1930's and 1940's. Rodchenko (1891-1956) was among the pioneers of modern art, filled up enough with it that by 1921 he and a group of other Soviet Artists gathered for a show called 5x5=25, which effectively was an anti-art show, declaring in its works the end or death or withering of art. 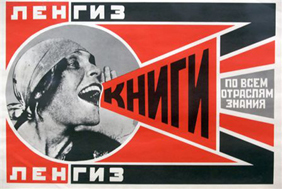 Rodchenko presented monochrome works1 deciding to abandon painting. Rodchenko continued in art though in other venues, working in sculpture and design in the 1920's-1940's,and returning to abstract expressionism in the 1940's. "September-October: With Alexandra Exter, Lyubov Popova, Stepanova, and Aleksandr Vesnin, presents work in 5x5=25, a two-part exhibition held at the Club of the All-Russian Union of Poets (Klub vserossiskogo soiuza poetov). Each artist shows five works in each part. The first part opens in September and features works especially produced for the occasion; Rodchenko exhibits Line (Liniia,1920), Grid (Kletka, 1921), and the three monochrome paintings Pure Red Color (Chistyi krasnyi tsvet), Pure Yellow Color (Chistyi zheltyi tsvet), and Pure Blue Color (Chistyi sinii tsvet, all 1921), which are often referred to as a triptych..." from the Museum of Modern Art website presenting their 1998 Rodchenko Retrospective; this section being a useful chronology of Rodchenko's career. No doubt there are many examples of finding people in bed on title pages of books printed in the high Renaissance and Baroque--I found two pretty quickly. Of course it would make sense to look at medical titles, as in the case of many examples where the borderland images of decorated title pages surrounding the text describing the book were often filled with allegrocial tales, which means that at some point in the allegroy involving medicine that sooner or later someone is going to wind up in bed, overseen by their physician. The book is by Maritn Pansa (b. 1580), and the title to the Appendix consilii antipodagrici specialis darinnen X consilia specialissima (printed in 1615) shows lives that were led basically in pursuit of pleasures and vice and crime that would eventually lead to the big bad straight bed at the end of their perceived crooked road. The title page tells of lives lived in pursuit of hunting, and wine, and women and song, as well as the abuse of children--creature comforts and vices which would eventually lead the practionner to a sick-bed for their pursuit of foul ends. The baseline here is a warning for those living a High Life in perhaps-exalted states would more than likely pay for their lifestyles with sickness in the end. Another good example is fond in Galen's Tertia Classis uarias morborum differnetias, obseruationes, tempora, successius, causasqe & signficatio nes amplectitur..., which was published in Venice in 1541 with a beautfiul woodcut title page illustrated by a follower of Titian. First and foremost, the capstone of the border images shows a sick patient being attended by doctors of classical greatness including Galen himself (at the extreme right of the first image, above). Galen (Aelius Galenus or Claudius Galenus (AD 129– c. 200)), was an ancient too, and taking this little trip through time he must've seen some surprising things, not the least of which would have included this bed. It should be noted that until the publication of the revolutionary work of Vesalius, Galen was the largely-unimpeachable source of medical knowledge for some 1300 years. On the History of Title Pages: the First Image of a Suicide on a Title Page? For a number of years following the invention of the movable type press, title pages were very simple affairs, generally starting with a simple statement of the title (the incipit) and then right off to the beginning of the book, right there on the same page, with the information about who printed the book where and when saved for the final page of text, the colophon. Ornamentation came a little slowly (or perhaps slowly), with the first recognizable-to -modern-eyes title page appearing in the Calendarium of Regiomonatnus, printed in woodcut and metal-type in Venice in 1476, with the date unusually displayed in Arabic numerals. The issue of more appealing display in book presentation--the approachable title page, illustrations and covers--became a true issue after the printers in Augsburg in the 1470's revolutionized book production by introducing a more industrialized method of production. The issue of illustration really didn't start to ramp up until after 1500 when the expensive and time-consuming standard of using woodblocks in the production of images was replaced by the copperplate engraving. And it was during this time, in the very early 16th century, that ornate and illustrated images began to appear on the title page itself. One example of a curious approach to illustration belongs to Hans Holbein, who created a somewhat three-dimensional ornamental and cascading title page that also happened to contain an image of Cleopatra in a suicide-by-snake. The snake may have been an Egyptian asp, and perhaps not, if she committed suicide by this manner at all. Cleopatra finally was led to this end on 30 August 30 BCE after a long string of affairs and consorts with Rome and its Emperors, failing finally after the death of Marc Antony and the rejection by OCtavian (who later would become Augustus, perhaps the greatest of Roman Emperors). In any event, we see Cleopatra here committing the deed, with what may be some of Antony's Alexandria-based fleet in the background. The design was copied many times, and used for a number of different title pages--the first time being in a work by Erasmus in 1523, and in the example below, later, in 1526. Offhand it is difficult for me to say if there are earlier suicides on thte title pages of books, but this would certainly be among the earliest, if not the earliest yet.